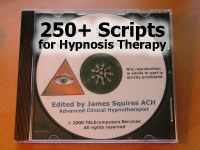 Dr. James Squires, ACH (Editor) / Published February 2011 This is the full 250+ product - only for previous buyers of the 150+ scripts version. A collection of scripts, inductions, techniques, deepeners, convincers, suggestions and therapies. Also includes (except plain text version) planning forms, worksheets for pre-session interviews and inventory lists for pre-session planning. Click here for complete details and table of contents - save shipping time and money with Instant Download. Instant Download - compressed ZIP file size: Word 385kb; Text 424kb. Not for Resale.